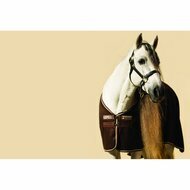 The Rambo stable rug is made of breathable 1000D ripstop polyester. 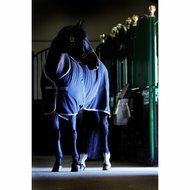 The inner layer is made of soft microfibre lining which keeps the horse warm and comfortable in the stable. This classic model has a double hook / eye closure on the chest, cross surcingles and a leg strap. The blanket is 0 grams lined and not waterproof. 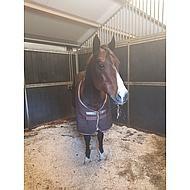 Not provided with the Horseware liner system. fine blanket beautiful and soft fabric which makes the blanket very chic. Order and delivery easily. Very good quality, good fit. Can recommend the blanket. 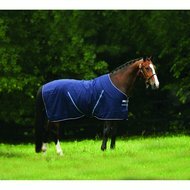 Answer: This blanket has a 1000D ripstop outside without filling. Question: Which material was the blanket made of? Cotton? Answer: The blanket is made of 1000D polyester. Question: Hello, which filling does this blanket have? Answer: The inside of the blanket is made of nylon. The blanket is not lined. Question: Is this a lined (double-cloth) blanket. I have a similar one, but that is too small for my new horse. Answer: This is an unlined blanket. 0 grams. Question: Is there a single fleece layer in this blanket as a lining? Answer: This blanket has a Microfiber lining. Answer: It is unlined and a bit similar to a summer blanket.